By now most of you have probably heard or read baby Lexie’s story, and if you haven’t just take a minute to read the letter Robi, her 7 year old brother wrote to her when she passed away last Tuesday, July 17th, 2012. It has been incredible how many messages of support we have received for Angela, mama Lexie & her brother Robi. Many have also gone the extra mile to send financial contributions to help off-set the 4 million Ksh (approx. $50,000) hospital debt that Angela is now faced with, but we still have a VERY long way to go. So far we’ve raised about 1.5 million Ksh (approx. $18,750), which is a MASSIVE accomplishment in just 3 days since we shared Robi’s letter. If you have already made a contribution, I just want to take this opportunity to appreciate you, and if you haven’t, maybe this little story might inspire you to. So I woke up at about 3:15 am this morning with mama Baby Lexie on my mind, and I just couldn’t go back to sleep. I was racking my brain about ways to raise more awareness about Angela’s situation so that we could help her just grieve the loss of her precious angel, who has really touched the lives of thousands of Kenyans, and indeed people in other parts of the world. Then I thought to myself, “Why don’t we try and record the beautiful song that Josea composed & shared with us at the fundraising event we held for Baby Lexie last Friday?” Eureka, I thought! See, I actually met Josea, a budding young musician, last Wednesday at the Open Qorner, a monthly event by my adopted mother Tazim Elkington. Tazim and Josea had met in March this year at “100 Girls in 100 Days” another fundraising event hosted by my soul sister Sitawa Wafula. The reason I share all this is because I truly believe that the right people, meet in the right spaces and at the right time. And when we are open to receiving the gifts that the universe has to offer us, magic happens. This is what I think is happening with this journey & I hope you will share it with us. Back to my story. Tazim and Josea connected and I now understand exactly why – he is such a humble, gifted, passionate, wise, and incredibly generous young man. And while he is a struggling musician, that comes from a very humble background, lives in Huruma estate, works by day as a screen printer to support his younger siblings, and send money to his mother in Gem village (which is close to where Mama Sarah Obama lives :-)) whenever he can, he was still able to make the time to come and join us on Friday evening to share his music as a contribution to the fundraising process. Had I not been at Tazim’s Open Qorner, I would never have heard Josea sing the farewell song she had asked him to compose for outgoing Tribe Hotel manager Mark Somen and his wife. And as soon as he started to sing, I pulled out my camera & recorded what I thought was a song that needed to be shared with the world – “Safari Njema” which means Safe Journey. Even though I had promised myself to take the time that evening to just be present to the discussion, which incidentally was based on the question: “How much of life is planned & how much is chance?”, I couldn’t help but think of Baby Lexie as he sang farewell. So at the end of it, I just introduced myself to him, shared Lexie’s story, and asked him if he would join us on Friday evening. To my surprise, he said yes. Later that night, I sent him the link to Robi’s letter, and within 24 hours Josea had not only confirmed that he would be there, but he was also so moved by the letter that he decided to incorporate it into the lyrics of his song. Let’s just say that by the time Josea was done singing “Safari Njema” at the fundraiser, several people were in tears. What was already a really beautiful farewell song to me, became a song that I felt was now a part of our angel Lexie’s legacy, and I believe it was because all these beautiful souls were connecting in really powerful ways. By 5am this morning, I knew it just had to be done – we had to record the song and share it. So I sent Josea a message and asked him if he was willing to do a collaboration with other Kenyan artists and use the song to raise awareness and hopefully financial support. Once again, this 20 year old struggling musician, that I just met 4 days ago, agreed to come meet me at Mavuno Church with his guitar, so we could run the idea by my sister warrior Angie and anyone else willing to listen. Angie suggested I speak to Kanjii Mbugua, who was immediately willing to work with us on recording the song. As fate would have it, Eko Dydda, Kenya’s Male Performer of the Year, was the guest artist that performed at Mavuno this morning. So after the service, Angie and I asked both him and A-Star, another leading gospel musician, if they’d listen to Josea play “Safari Njema,” and if they’d be willing to do a collabo with him and Kanjii. So there we were, sitting in a circle in a tent, with Josea playing his guitar. By the time he was done, they were sold! But to my surprise, they suggested we just record the raw version of Josea playing his song, and share it with the world, just as it is. We hope you enjoy Josea’s gift “Safari Njema” (the VERY rough ‘jua kali’ cut), and we hope you are moved to pay it forward and help us raise the remaining funds needed to cover Baby Lexie’s hospital bills so that she can be laid to rest this week. 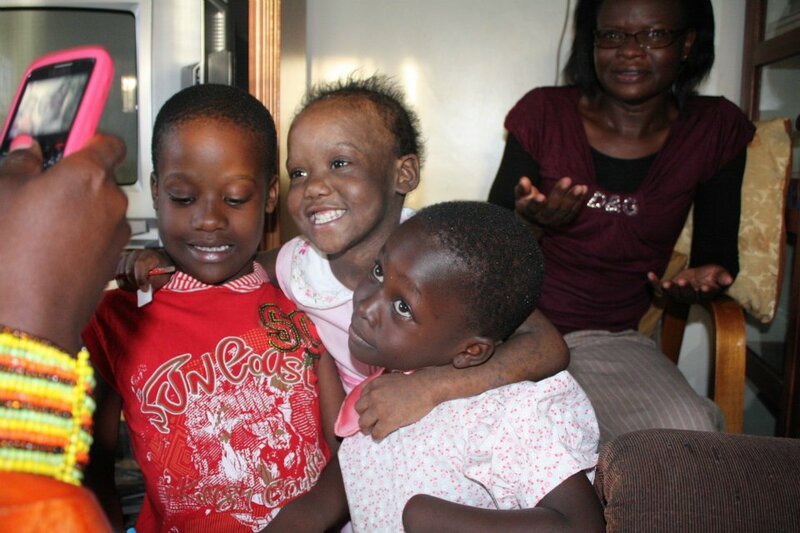 Robi (red shirt) with his sister Baby Lexie when we visited them at home on World Cancer Day – February 4th, 2012. Angela, their mother is in the background. 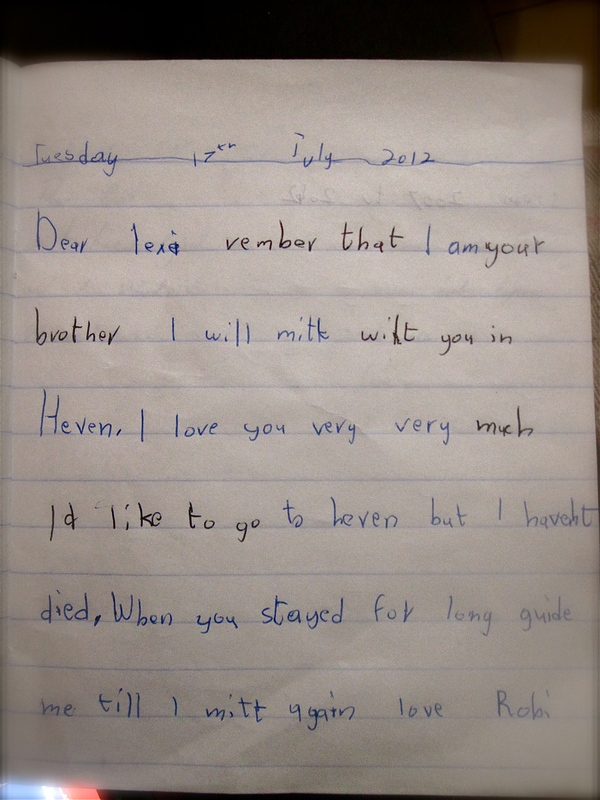 Dear Lexi, rember that I am your brother I will mitt witt you in Heven. I love you very very much Id like to go to heven but I havent died. When you stayed for long guide me till I mitt again love Robi. I don’t think I have ever heard a child cry like Robi cried last night. Ever! He’s only 7 years old and yet the sounds he was letting out were surely coming from the depth of his soul. All Angela could do was hold her baby in her arms and rock him gently as he grieved for the loss of his best friend – his little sister and angel Baby Lexie. Angela said that he had shed a few tears when she broke the news to him earlier in the day, and that he reacted the way any normal child would, but when he watched Citizen TV news at 7pm and saw the image of him pushing Baby Lexie in her wheelchair at the airport the day she arrived in Nairobi, after spending over a year in India getting treatment, he just broke down. I wasn’t even there when he started crying, but by the time I arrived probably a half hour later, he was still wailing, and everyone in the room just sat in a daze and red-eyed. What Angela feels, I cannot even begin to imagine and I won’t pretend that I do. This post is dedicated to Robi and all the other children in the world who have lost their loved ones to cancer. He may only be 7 years old but he’s wiser than we might think. What can one even say after that? I struggle to write this even hours after I heard these words. So I will keep it simple. Baby Lexie’s family needs our support. They have spent millions over the last 2 years as Baby Lexie fought for her life. The day she got back from India, we all celebrated, but alas, it wasn’t the end of her fight. There’s a gastronomical hospital bill to pay now, so if you can reach deep into your pockets and send any contribution, however big or small, it would go a long way. The family will be meeting this evening to discuss the way forward, so please check the Africa Cancer Foundation or Save Baby Lexie pages on facebook for updates. You can also follow @AfriCF and or @SaveBabyLexie on twitter. Send a message of support or condolence to the family by writing on any of the facebook pages or commenting here & we’ll share all the messages with Angel, Robi & the rest of the family. If you are on twitter, you can send your messages to them by using the hashtag #BabyLexie. Say a prayer for the family. Go and visit any children’s cancer ward in your nearest hospital. Send a financial contribution to mama #BabyLexie to help cover the pending hospital bills (see details below and on “Save Baby Lexie” facebook page). 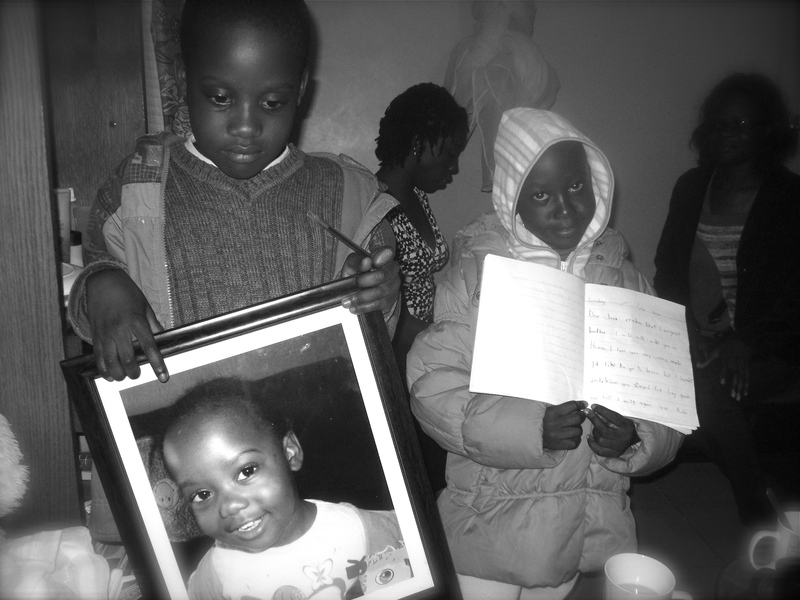 Robi holdiing a photograph of his sister Baby Lexie last night when the Africa Cancer Foundation team went to visit them at their home. There will be a fundraising meeting this Friday, July 20th, from 5pm at All Saints Cathedral, in Nairobi. They need to clear a hospital bill of approximately 4 million Ksh. If you are in Kenya, you can send your donation via M-PESA to 0725134767 (Angela McLigeyo)- mama Lexy. There will be a 2nd, and hopefully final, fundraising meeting this Tuesday, July 31st, from 5pm at All Saints Cathedral, in Nairobi. Fundraising target for today is 1.5 million Ksh. 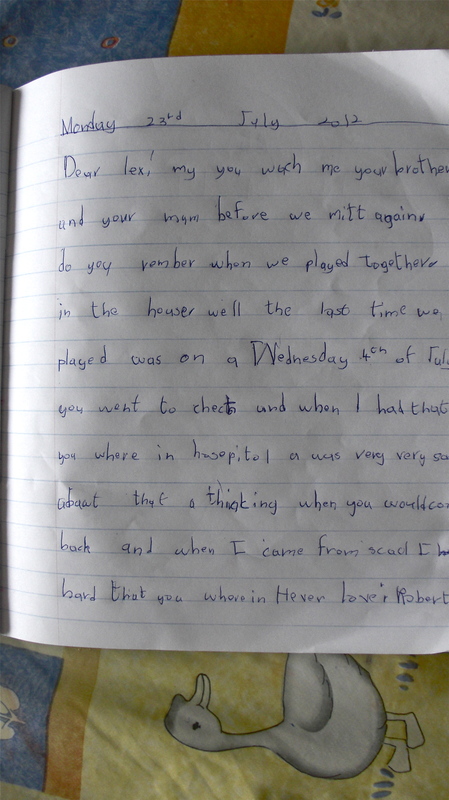 Robi is still writing letters to his little sister Lexie. This is one dated July 23rd, 2012. He really appreciates the support everyone has given his family so far.